The Pitney’s brand “Oven Roasted Chicken Breast Strips” subject to the recall may not look, smell or taste bad, but they could cause serious illnesses, according to the recall notice on the Canadian Food Inspection Agency’s website. Anyone who ate any of the recalled chicken strips should monitor themselves for 70 days afterward and see a doctor if they develop symptoms of Listeria infection. 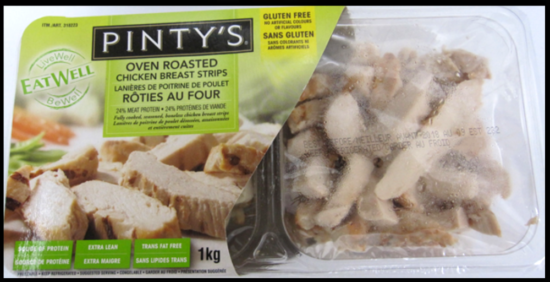 The Ontario-based Pinty’s company distributed the implicated refrigerated chicken strips to retailers in the Canadian provinces of Alberta , British Columbia, Manitoba and Saskatchewan. The recall notice did not specify what retailers received or sold the suspect product. Consumers should check their homes for unused portions of the recalled Pinty’s brand chicken strips. The CFIA is urging people to not eat the recalled food. They should throw it away or return it to the place of purchase. The chicken strips have best-by dates of Aug. 9 and Aug. 15. Symptoms of Listeria infection, called listeriosis, can include vomiting, nausea, persistent fever, muscle aches, severe headache and neck stiffness. Pregnant women, the elderly and people with weakened immune systems are particularly at risk. Although infected pregnant women may experience only mild, flu-like symptoms, the infection can lead to premature delivery, infection of the newborn or even stillbirth. In severe cases of illness, infected people may die. Tags: Canada, CFIA, chicken strips, food recalls, Pitny's Delicious Foods Inc.